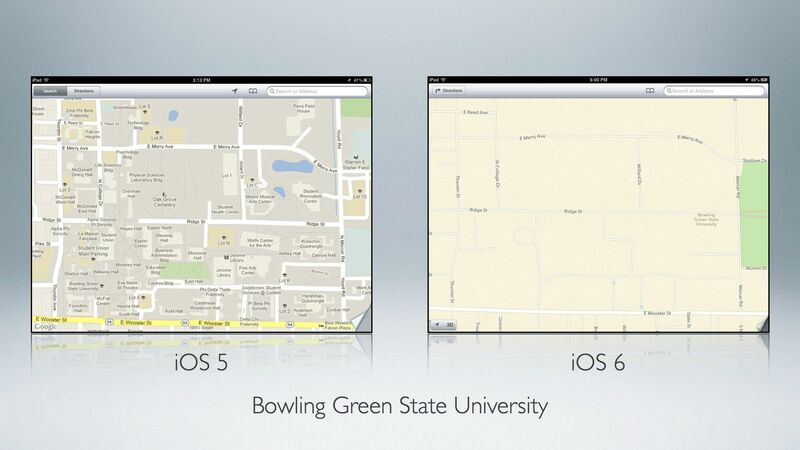 Is the new mapping app the “killer app” for iPhone 5? For those of you brave enough to upgrade your iGadgets to iOS6, you get a sneak preview of one of the “enhancements” Apple will be shipping with the iPhone 5 – their own mapping application. Oh, and in case anyone at Apple is listening, Motorways are normally coloured BLUE on maps in the UK and Europe. But, I’ve seen people who like Apple’s 3D maps (using aerial imagery). A case of eye candy over substance? Update: Seems the finger-pointing between Tom Tom (who provided backend data for Apple’s maps) and Apple has already begun. Android is looking really attractive right now. The Guardian now has this article on some of the other gaffes Apple appear to have made in their mapping data, and highlights that the most prominent feature in many cities is their Apple Store. Maybe so you know where to go to take it back to the shop?